Το παραδοσιακό χωριό Κριτσά βρίσκεται κοντά στον Αγιο Νικόλαο. Το χωριό που παράγει ένα από τα καλύτερα λάδια στο κόσμο, το χωριό που ο Jul Dasen γύρισε το «Χριστός Ξανασταυρώνεται», με τους υπέροχους ανθρώπους που σου ανοίγουν το σπίτι τους με μαντινάδες και σε φιλεύουν με αγάπη. Kritsa is one of the oldest and most picturesque villages in Crete, Greece, built amphitheatrically on a rock hill, named Kastellos, surrounded by olive groves, at an altitude of 375 m. It is part of the municipality of Agios Nikolaos. During the Middle Ages, it was thought to be the largest village in Crete. Kritsa has been destroyed many times during the last centuries because it participated in all of Crete’s revolutions. It is located 10 km from Agios Nikolaos and has about 1700 inhabitants. 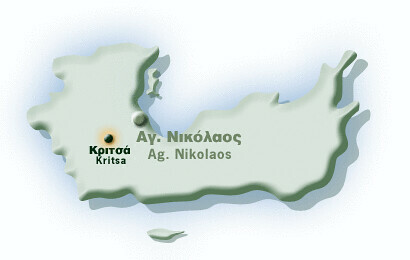 Kritsa has an extensive historic record with evidence of occupation as early as the second millennium BC. Near the village, three km to the north, are the ruins of the ancient Greek city Lato which was noted as one of the most powerful Dorian towns in Crete, with two acropolis. The oldest setllement in the Kritsa area, on the steep rocky hill south of the village named Kastellos, dates back to the 12-13th century BC (Late Minoan IIIC). Lato is thought to may have been founded when Kastellos was abandoned. Before the entrance of the village is the old Byzantine church of Panagia Kera with unique, in technique and importance, Byzantine frescoes (13th and 14th century). When Kritsa is lit up in the evening it has the form of a scorpion. Old Cretan customs and traditions are kept alive, and Kritsa is considered one of the most important centers of weaving art. The narrow streets are visited by tourists. From Kritsa there is an interesting and spectacular climb to the plateau of Katharo, which provides a panoramic view of Mirabello Bay, Agios Nikolaos and Kalo Horio. The Kritsa Gorge is located on the route to Tapes or to Lato. Here below you can see a video that shows the village, talks about the film «Christ Recrucified» filmed by Jules Dassin which was based on the novel written by Nikos Kazantzakis and the production of olive oil. Kritsa’s olive oil is one of the finest ones globally and has taken many awards. The video ends with a traditional oil making «factory» which is now a museum.